NCDA&CS is moving forward with mortality management, regardless of FEMA’s assistance. The Department has been diligently working to sign contracts and putting procedures in place to support composting and landfill tipping fees. Growers should work through their integrator or reach out to the Ag Disaster Hotline (866.645-9403) if they have not already done so. Rendering, land-filling, and incineration are typically done off-farm while composting, burial and hydrolysis can be accomplished on-site depending on available land and resources. Mass mortality composting is the best on-site disposal option. It utilizes aerobic bacteria to decompose the mortality, reduce odors and destroy pathogens. The process duration varies from 1 month for poultry mortality up to 6 months for larger animals. After successful composting, the material can be safely applied to crop fields and pasture land. Trained composting experts: The Animal and Plant Health Inspection Service agency (APHIS) of the U.S. Department of Agriculture (USDA) trains subject matter experts (SME) on mortality composting. SMEs are dispatched by the NCDA&CS to guide house clean-out, windrow construction, assess composting and verify process completion. Dry carbon source: mortality composting requires sufficient amounts of material with biologically available carbon. 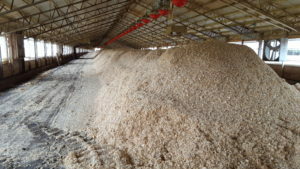 Example of these sources include wood chips, shavings, chopped hay/straw, small grain hulls. Note that Some carbon-rich materials, such as demolition waste, painted and treated wood have poor wetting properties and cannot be used for composting. Bermuda grass although abundant does not constitute a favorable carbon source due to (1) high moisture content, and (2) inability to improve airflow in compost mix. Suitable site: this could be the poultry house itself or land with recommended setbacks from residential areas and water resources. For details on setbacks for outdoor composting please refer to N.C. Guidance for Composting of Mass Animal Mortality (NCDA&CS). Handling equipment with trained operators: Equipment such as skid steers, tractors with trained operators are required to clean the houses, blend the carbon sources, construct and turn the composting windrows. Assess damage to the flooded house(s) by inspecting the depth of muck (dead animals, bedding, and standing water) in the houses. Ensure no effluent from flooded houses reach streams or wells. You can achieve this by building a barrier of carbon material to stop/divert effluent flow. Add a layer of carbon source to the flooded house and let stand for one to two days (ventilate the house if power is available to speed the drying process). Use skid steers and tractors to form two windrows inside the house against the walls. Add carbon material if needed to achieve 60% to 70% moisture content. Prepare larger animals (i.e., finishing pigs mortality) by puncturing abdominal cavity to speed the composting process. The mortality composting process can proceed inside the house or outdoors. In most cases, mortality composting is accomplished outside to allow house complete cleaning and continued production. The mixture is hauled outside of the animal houses and used to form windrows. The windrow consists of (1) base layer of carbon source (e.g. wood shavings) between 18 and 24 inches, (2) the blend of carbon source and house clean-out residue (mortality, manure, spilled feed), and (3) A cap of carbon material to cover the composting blend with a thickness between 18 and 24 inches. Close temperature monitoring is done daily during the first 14 days. Temperature is measured using long-stem thermometer by taking 10 temperature reading distributed along the length of the windrow at two depths (18 inches, and 36 inches) from the surface. The standard for successful heat-up is achieving 130° F for 72 consecutive hours. If windrows do not heat up, mixture is adjusted by mixing in dry carbon source or water/wet material before forming new windrows. Windrow turning typically done 6 weeks to 12 weeks into the composting process but timing is determined by SMEs based on the windrow condition. A second heating up after turning is essential to the success of composting. After the designated SME evaluates the compost windrow and verifies that the process has been completed, the compost can be moved for storage or land application.